Blues supporters were understandably jubilant after Pompey beat old rivals Plymouth 3-0. 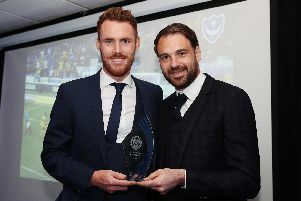 Here's a selection of what they had to said on our Portsmouth FC - The News Facebook page. Paul Brooks: Well done Pompey - great win today. Daniel Moth: Ronan Curtis is a gem of a find. Paul Muddiman: Great result. Well done Kenny. Nigel Cole: Be interesting to see what Derek Adams has to say about the match. Andrew Baker: Going forward we now seem to have the formula for goals. We're creating chances and taking them and just to think there were those last weekend informing us that Ronan Curtis simply wasn't League One level player - you're probably right there! He's keen to impress, a rough diamond if you like... but a diamond nonetheless. At the back we've still not conceded, other than two OGs, our keeper's only had to retrieve a single penalty. The balance of the team looks right, we've made some impressive loan signings, some of whom simply cannot get into the side at this moment in time.